/ On the road leading to Pranzo. In the background Tenno castle. / A look at the lower section of the "Pinza"
The total altitude difference of route 735 is just under 650 meters and alternates between asphalt and disused dirt roads. Rare are the moments where you can rest your legs with gradients that continue to vary - reaching just over 15% in some sections. The proposed descent is called “Pinza", which has featured as a segment in the famous "Adrenaline" race. In its initial stretch, the old dirt / gravel road is fairly flowing with a gradient that gradually increases. In the second half it reaches 20% over long cemented sections. Some slightly exposed points, offer remarkable views. Given the gradients mentioned above, it is essential to always check your speed using both brakes, especially when wet and during the autumn season. ALWAYS WEAR YOUR HELMET ! Suggestions taken from NORBA and IMBA codes of conduct. Riding your bike requires specific clothing and equipment, even for relatively short and easy trips. It is always better to be prepared… e.g. for bad weather or a drop your energy levels. The unexpected things also make up a part of the fun! Remember to throughly evaluate the type of route you plan to do, the locations you plan to cross and the current season. Has it been raining? Attention: The paths may be slippery and require more caution. What do I need to bring on my bike tour? It is always advised to let someone know where you plan to go and how long you expect to be. The texts relating to the route described in this sheet have been produced by Marco Giacomello, mountain bike guide. 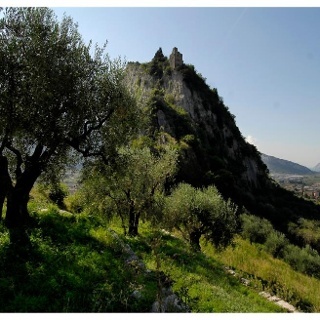 The route departs from Riva del Garda, next to the Garda Trentino Tourist office. You must pass through the old town where there is no route signage. So, from the tourist office head north to the roundabout, keeping left to take the cycle path of via Dante Alighieri. Once you reach Viale Roma, turn right and follow the road to take the next turn left onto Viale Pilati. At the junction turn right onto viale Giovanni Prati and continue straight onto Via Ardaro. Here the climbing starts gently, but prepare yourself for the very different gradients ahead. 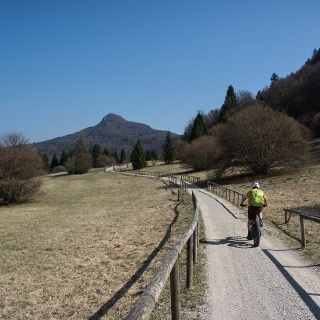 After crossing the village of San Giacomo, a little before reaching the crossroads you will see the signage for MTB routes 734 and 735 which lead you across the road where you must take the steep slope on your right which runs along the Albola stream. The slope reaches 20% here and at the first fork, led by the signage, keep right where you can catch your breath for a few metres. Follow the narrow dirt road which will join with the provincial road toward Lake Tenno. At one of its hairpin bends, keep to the left taking a disused dirt / gravel track. The steepest stretch of climb is behind you at this point, but the ascents are still challenging. The alternative is to follow the normal/main road up to Pranzo, as do many road cyclists. If you have the strength to stay on the dirt road, continue as indicated until you meet the asphalt road again, follow this for a few hundred meters, up to the next bend at Deva. Following the curve of the road, spot the sign leading you sharp right, continuing to climb again a dirt/gravel section eventually returning to the main road leading to Pranzo. After passing through the narrow passageway regulated by a traffic light, follow the signs left to leave the provincial road for Lake Tenno and continue through the famous chestnut groves of the area. Back on the normal road keep left to reach the village of Campi. The directions lead you through the centre, passing in front of a church. At the end of the village, continue straight until you see the signs that indicate to keep left, abandoning the other signposted directions for route 734. The time has come to descend - passing in front of the characteristic church of San Rocco continue straight to the entrance of the Pinza descent, on your right. From here the terrain returns to a more forgiving gravel kind. Take the time to enjoy the panorama, but please check your speed: even though the path is quite large, some sections are a little more dangerous. By the last section, on cement, your brakes will be very hot. Finishing the descent you are practically at the entrance to the centre of Riva del Garda, your starting point. 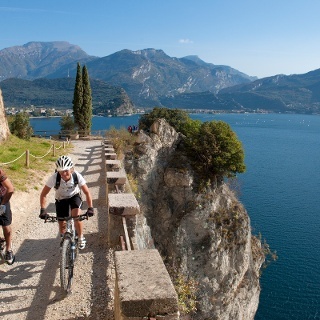 To reach the start of this route it is necessary to go through the old town of Riva del Garda, using the bicycle lanes and main roads. Free parking in Riva del Garda at the old hospital (via Rosmini) and the old cemetery (Viale D. Chiesa). Pay parking at the Public Gardens Porta Orientale, Roman Baths, Viale Lutti (Ex Agraria), Monte Oro, Blue Garden. Sehr schöne Tour besonders was die Aussicht angeht. Die Abfahrt ist leicht über Schortter wobei wenn man schneller fährt und die kleinen bis mittleren Steinstufen mit nimmt es auch schwieriger wird. Tolle Tour. Landschaftlich schön, sehr geringer Trailanteil. Wer seine Kondition testen will fährt die Tour in der umgekehrten Richtung. Schöne kurze Runde für den Nachmittag. Allerdings ist es nicht die original Adrenalina, diese geht vom Bocca di Trat über Capanna Grassi nach Riva. Fahrzeit liegt eher bei 1:30 - 2:00. Geht auch deutlich schneller.